Netherlands vs Belarus World Cup 2018: It is the second match day of the group stage of the World Cup 2018 qualifying Europe and today we have two teams playing from group A. it is Netherlands hosting Belarus at the De Kuip in Rotterdam. Both teams are group A with Bulgaria, Sweden, France and Luxembourg. Netherlands are second on the table with one point from one game, two points below Bulgaria and above Belarus who are fourth on the table. Belarus have one point from one game, above Luxembourg by one point. Netherlands were not able to qualify of the Euro 2016 and they would not want to repeat that with the World Cup coming now. They played their first game of the group stage against Sweden and was able to draw their game by 1-1. The game was played at the Friends Arena in Stockholm and it saw a huge crowd of 36,000. The deadlock was broken in the 43rd minute as Marcus berg scored the first goal of the game for Sweden to make it 1-0. 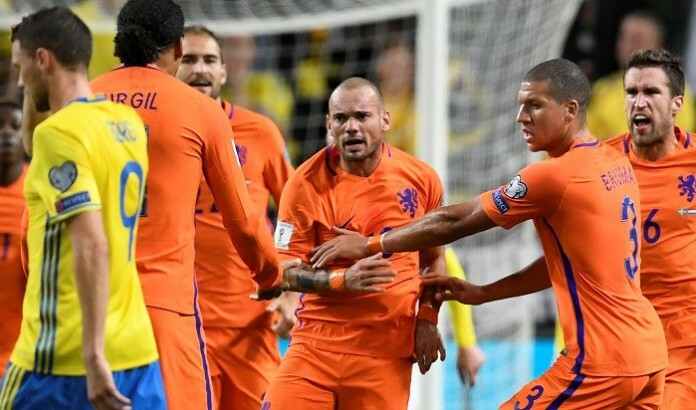 After that Wesley Sneider got the equalizer for Netherlands in the 67th minute and the game ended at that. Netherlands dominated the whole game as they had 70% possession, had 24 shots on goal out of which nine were on target. Sweden on the other hand had just 30% of the ball, eight shots on goal out of which three were on target. Belarus also drew their first game of the group stage against France by 0-0. The game was played at the Stade de France in Paris and even though France dominated the game Belarus defended very well and in the end the game ended in a draw. Belarus had just 30% possession, three shots on goal out of which none were on target. Being an important game both teams will try their best to get those three points.